Here are the single member district vote totals, nationwide, for the 14 December 2014 House of Representatives election. Taking a rough view from the difference between the single member district and the proportional voting, Komeito voters provided over 6.5 million votes of the 7.8 million vote difference in between the LDP's SMD vote and its PR vote. Roughly speaking, Komeito voters provided 1/4 of all votes received by LDP candidates in the districts. Anyone want to venture a new guess when the LDP/Komeito divorce will take place? 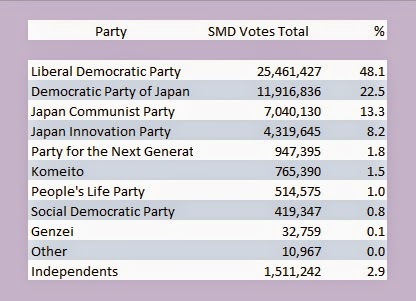 Notable is the number of SMD votes for Japan Communist Party candidates, with a nearly a million vote difference in between the SMD and the PR numbers. When the Communists were the only opposition or the other choices were an unattractive mainstream opposition candidate and an LDP candidate, Communist candidates received the protest vote. Then again, in 2012, the JCP received over a million of these protest votes, in an election where the voters had many, many more choices.